This is a dual channel Solid State relay module featuring 2 x Omron G3MB-202P solid state relays. This module is capable of switching an AC voltages between 100 and 240V at up to a 2A current. The module can be controlled from 5V digital source such as Raspberry Pi, Arduino or any 5 volt microcontroller. A resistive type fuse is provided on the module to help protect excessive current draw. OMRON 5V 240V solid state relay 2A, output with resistance type fuse 240V 2A. The 2.54CM pin and blue KF301 terminal is connected to the line of control more convenient. 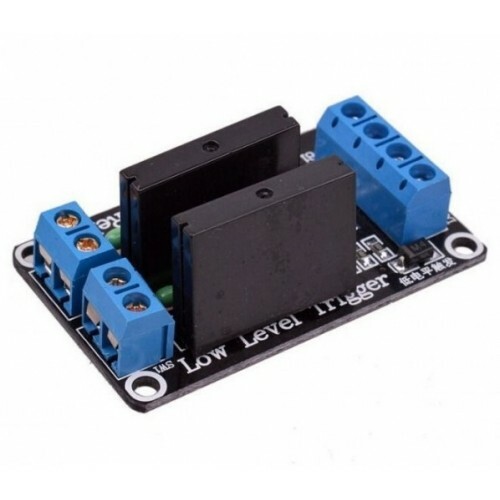 High level trigger refers to the signal trigger end (IN) had a positive voltage and the negative pole of the power supply is usually between, and the triggering end of a trigger connected with the positive pole of a power supply, when the trigger end has a positive voltage or reached the trigger voltage, the relay is attracted. Low level trigger refers to the signal triggering voltage between the end and the negative electrode of the power supply is OV, or trigger terminal voltage lower voltage than the positive power supply voltage, low to can trigger, make the relay, is usually the cathode of the power supply and the triggering end of a trigger mode connection, so that the relay is attracted. 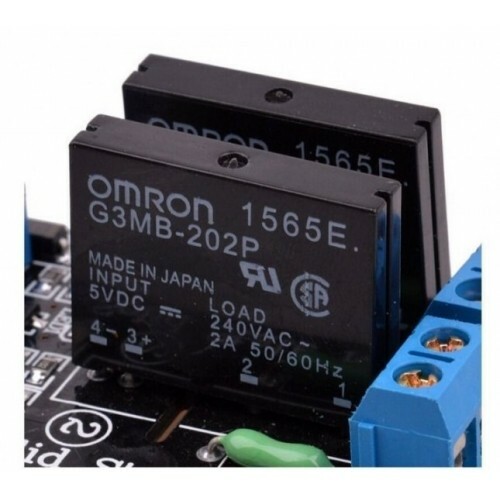 1 Channel OMRON 5 volts Solid State Relay 1-Channel Solid-State Relay is some what similar..
4 Channel OMRON 5 Volt Solid-State Relay4-Channel Solid-State Relay is some what similar to that of ..